● Daniel Suárez started Stage 1 from the 20th position and ended the stage 12th. ● Suárez worked his way up to 14th when the first caution of the race was displayed on lap three. ● The 27-year-old stayed out and worked his way up to 10th before the second caution came out on lap 38. He pitted for fuel, four tires and adjustments to help his car’s tight condition. ● The Haas driver restarted 14th on lap 45 and worked his way up to ninth before settling in at 11th when the third caution came out on lap 118. ● Suárez pitted for fuel, four tires and adjustments and restarted 14th with two laps to go in the stage. ● Suárez didn’t pit during the Stage 1 break and began Stage 2 in the eighth position. ● The No. 41 driver started Stage 2 in eighth and completed it in 10th to earn one bonus point. ● Suárez worked his way up to sixth before his No. 41 Mustang tightened up, and he slipped back to eighth. ● During the fourth caution on lap 214 Suárez came down pit road for fuel, four tires and adjustments to help the tight condition. He restarted seventh on lap 219. ● He pitted during the Stage 2 break from 10th for fuel, four tires and adjustments. Unfortunately, Suárez received a speeding penalty and was sent to the rear of the field in 17th. ● The Mexico native began the final stage in 17th and concluded it in eighth. ● The next caution was displayed on lap 270. Suárez came down pit road for fuel, four tires and adjustments and headed back to the track in 17th. This time Suárez received two penalties – for pitting outside of the box and an uncontrolled tire – causing NASCAR to hold the No. 41 machine one lap on pit road. ● After restarting 18th, one lap down, Suárez hustled his way around the half-mile venue but remained one lap down when the caution was displayed on lap 375. ● The Ford driver pitted under the caution for fuel and four tires and remained one lap down in 17th for the restart. ● When the next caution came out on lap 415, Suárez was the beneficiary of the free pass. He pitted for fuel, four tires and adjustments and returned to the track in the 16th position. ● The next caution came out on lap 432 as the Haas Automation driver ran in 12th. He stayed out and restarted 10th on lap 439. ● The final caution of the race came out on lap 479 while Suárez was running in the eighth position. He stayed out, restarted third with 14 laps to go and ultimately finished eighth. ● Suárez earned his fourth top-10 of the season and his third straight top-10. ● Suárez’s eighth-place result bettered his previous best finish at Bristol – 11th in April 2018. 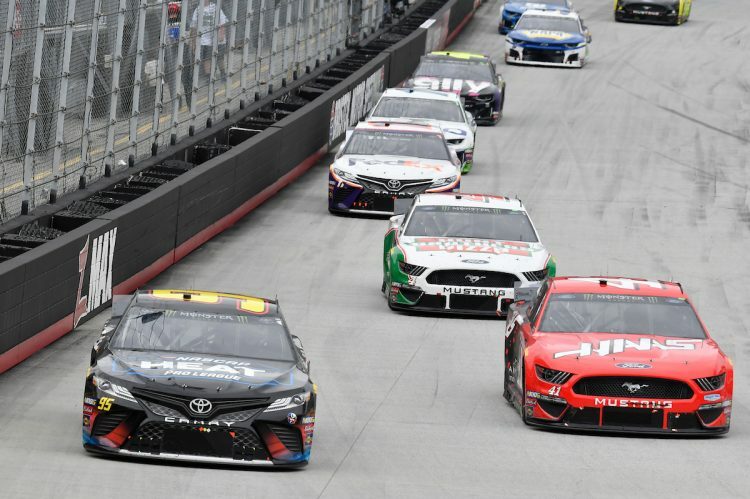 The Food City 500 marked his fifth career Monster Energy NASCAR Cup Series start at Bristol. ● Suárez finished 10th in Stage 2 to earn one bonus point.